This post explores how to make sure that, at least when you are developing and testing your code, you do not inadvertently spam your users. Does your application send out emails? Lots of emails? Do you ever get that feeling like someone punched you in the stomach when you realize that you mistakenly sent out hundreds or thousands of emails to your users when you didn't mean to? I have. It's a terrible feeling, and these days, in the age of GDPR, there can be real consequences for invading the privacy of your users. This post explores how to make sure that, at least when you are developing and testing your code, you do not inadvertently spam your users. 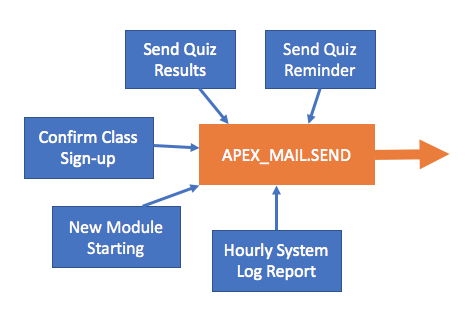 In other words, wherever and whenever I need to send an email, whether it is from the quiz manager package, the class manager package, or the site admin utilities package, I simply call apex_mail.send directly. Like I said, I could take this approach, but that would be a really bad idea. Why? With multiple accesses to the "core" send email procedure, it is difficult to put any kind of controls in place regarding email delivery and also more challenging to debug and enhance email-related code. When running in development or test, our users should never get an email. Specifically, unless the email "send to" is one of our developers, redirect all emails to the admin email address. In other words, we still need to see the emails to verify the format and other behaviors, but those emails should never "escape" from the development team. If APEX_MAIL.SEND is called from dozens of locations in my code, then I need to go to each of those locations and apply my rule. Therein lies the madness and the inevitable mistake that results in emails spamming users. Never call APEX_MAIL.SEND directly. Instead call qdb_communication_mgr.send_email. 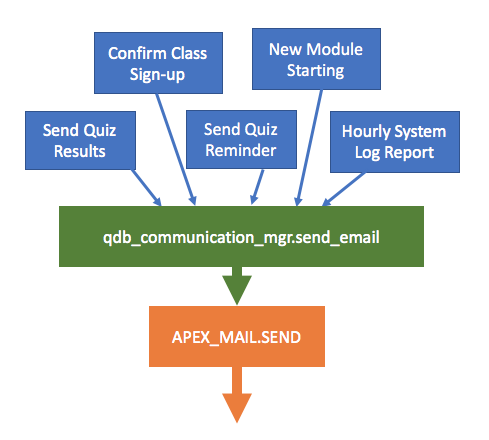 By following this rule, we ensure that APEX_MAIL.SEND is called in just one place in our entire code base: inside our own wrapper, the qdb_communication_mgr.send_email procedure (the "qdb" prefix translates to "quiz database"). I create a nested function to return the email address to which the email will be sent. Inside that function, I have all the logic to implement my requirement. The qdb_utilities package contains a function that returns TRUE if I am currently running this code in production. Since the only call to apex_mail.send occurs within my send_mail procedure, I am now 100% protected from accidentally sending out an email to users when it was not intended. I don't always push the email out of the queue. For example, when I am doing a batch email, I want to wait until everything is put on the queue and then push it. If I am notifying a user of a specific event or accomplishment, I might want to push immediately. So, nothing terribly fancy, no rocket science. Just another demonstration of how encapsulating low-level functionality to control access to that functionality gives you flexibility and control that is otherwise very difficult to achieve. Once you've gotten your encapsulation layer in place, it becomes really easy to add more functionality to your email management features. For example, we recently added our own email queue so we can re-send an email if there was an error and also verify that emails were produced and sent as expected. If you have not already protected your users and yourself from the trauma of an accidental spamming, I hope that you can learn from and use the approach we've taken. Have you taken care of this problem in another way? Do you have suggestions for improving on what we've done? Please let me know in the comments section. What Is GDPR and Why Should Database Administrators Care?